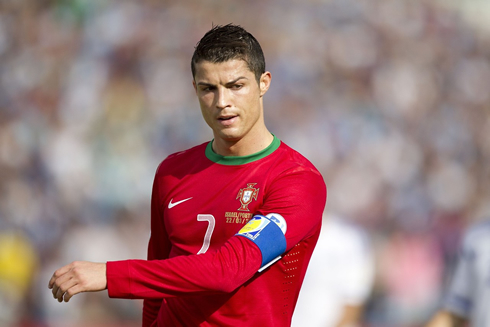 A 3-3 draw was the best result Portugal has been able to pull off from their trip to Israel, this Friday morning. The Portuguese side struggled to display their best version on the pitch and have never impressed much througout the entire game. Cristiano Ronaldo didn't score but assisted Hélder Postiga for his team's 2nd goal, just a few moments after he was shown a yellow card that will rule him out from next Tuesday's match, against Azerbaijan. 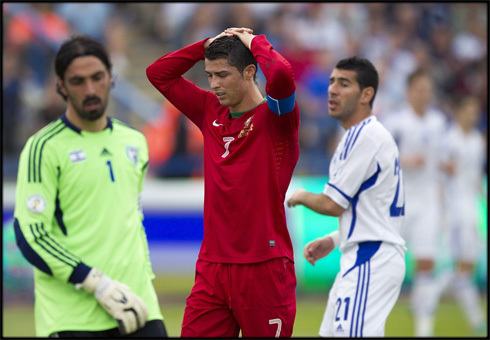 Portugal had a disappointing result and performance earlier this Friday, as they didn't get past a 3-3 draw in Israel, in another fixture for the 2014 Brazil FIFA World Cup qualifying stage. The two teams will continue tied with 8 points in Group F's 2nd place, at least until next Tuesday. The Portuguese goals were scored by Bruno Alves, Hélder Postiga and Fábio Coentrão, but the "Seleção" has never been able to impose the best of their game and were actually down by two goals with 20 minutes left to the end. The late reaction was initially fueled by a Cristiano Ronaldo run in the 72nd minute, from which Postiga only had to tap-in the ball to an empty net. Later in the game and already inside added time, Fábio Coentrão scored the equaliser that rescued a vital point for Portugal and their quest for the 2nd place in Group F. Apart from the result, the bad news for Portugal is that Ronaldo will miss next Tuesday's game against Azerbeijan, as he got shown a yellow card after kicking out the ball with the game already stopped. The home side got the equaliser on the 24th minute, after a good run and cross on the right, that exposed some of this Portuguese defense weaknesses. The ball would end up falling in Tomer Hemed's feet and the Mallorca striker finished it with class, with a spinning shot that had no possible defense for Sporting's goalkeeper, Rui Patrício. All even at 1-1 and a clear feeling that this game was still far from being over at that point. Things got worse for Paulo Bento's men still before half-time, as Israel would complete the comeback near the 40th minute of the first half. A bad pass deep inside the Portuguese half allowed for Israel to quickly counter and send Ben-Basat into a 1-on-1 goalscoring situation against Rui Patrício. The Toulouse forward showed no hesitation and blasted it into the net, making it 2-1 for Israel. The first signs of despair and frustration started coming off from the Portuguese players and it wouldn't become any easier for most of the remaining time in the second half. As if it couldn't get any worse, Cristiano Ronaldo kicked a ball in despair after the referee had already blown the whistle and was shown a yellow card. That incident didn't have much of an impact in this Friday's game itself, but since it's Ronaldo's second yellow card on this qualifying stage, it means that the Real Madrid striker will be ruled out for this Tuesday's game against Azerbaijan, to be played in Baku. According to the latest reports coming from the Portuguese media, Ronaldo will still travel to Azerbaijan for at least give some moral support to his teammates. It took no longer than 2 minutes for Portugal to finally react and be effective, mostly thanks to a initiative from Cristiano Ronaldo. The 28-years old picked a nice direct pass from Vieirinha, who had just joined the game 10 minutes before, got rid of a defender using his speed and pace, and assisted Hélder Postiga for an easy empty net goal. We had finally seen a Portuguese attacking play gifted with a beginning and an end, as well as a small sample from what Ronaldo can do for this team when he gets well served. There was still plenty of time for going after the 3-3, but we had to wait until the final moments of the game for the Portuguese players to find reasons to celebrate again. Benfica's midfielder Carlos Martins put in a cross into deep inside Israel's six-yards box and the giant Hugo Almeida managed to anticipate Dudu Aouate, heading the ball right into the crossbar. It would then bounce in front of a couple Israel defenders, who attempted to clear it away, but ended up shooting the ball against Fábio Coentrão, sending the ball backwards right into the back of the net. This final 3-3 draw might be crucial for the head-to-head fight for the 2nd place between Portugal and Israel, now that Russia will have a golden chance later this Saturday, to go 7 points clear their direct opposition. Cristiano Ronaldo next game for Real Madrid will be against Real Zaragoza, on March 30, 2013, for the Spanish League. Even though he's ruled out from the game against Azerbaijan next Tuesday (March 26), Ronaldo will still travel with the Portuguese National Team to Baku. You can watch Juventus live stream, Azerbaijan vs Portugal, France vs Spain, Montenegro vs England and Mexico vs USA, all matches provided from our live soccer section.